For the first time on the Northern Beaches at our nail salon in Newport, we bring to you the hottest and latest craze in nail colour. Shellac Manicure and Shellac Pedicures. You must be wondering what is Shellac? Shellac is a cross between traditional nail polish and gel nails. It is applied like nail polish but it dries like gel. It lasts for over 14 days and does not chip or smudge and does not lose its shine and shimmer. For over 14 days, your hands and feet look as if you have just come out from salon with a manicure and pedicure. Shellac manicure and Shellac pedicures does much more for your nails than just looking good. Many women have noticed that Shellac colour makes your nails stronger, refined and healthier. Shellac is smudge proof nail colour and chip proof nail colour! We have a trained team of nail professionals at our nail salon in Newport providing Shellac nails manicures and Shellac pedicures. Although Shellac manicures and pedicures is a little lengthier process but once done the time spent is worth it and no need to wait for drying time, which completely avoids any smudging. The manicure and pedicure process is the same as any other manicure and pedicure but is preferred more because after each layer of applying the Shellac, it is cured underneath a LED lamp and the Shellac is immediately dry. This process is repeated two times and finally each nail is wiped with alcohol to remove the sticky film from nails. And then, you are ready to flaunt your Shellac colour manicure and Shellac colour pedicure to all your friends and make them jealous. We have been providing beauty solutions on the Northern Beaches in Newport for a long time. Now, we have the icing on the cake with the Shellac! Shellac Manicure and Shellac Pedicure. Shellac manicure and Shellac pedicures is cost effective in the long run as it lasts longer than the normal manicure and pedicure. Shellac is a healthy alternative to acrylic and acetone based nail polishes. 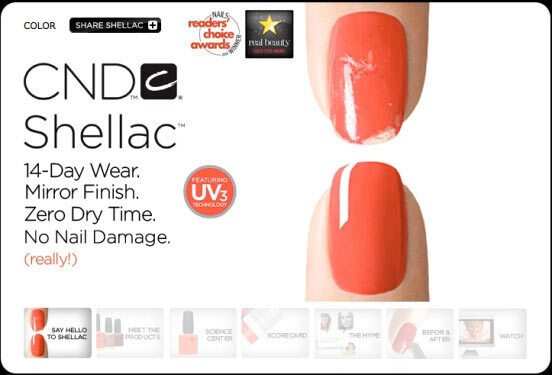 Shellac is a faster-curing, thin formula and comes in bottles with brush applicators and cures under a specially designed LED unit (light emitting diodes). So no harmful UV rays!! Lightening speed, 30 second cure. Shellac is fully LED cured from foundation to finish in JUST 4 minutes!! So what are you waiting for? Come girls and ladies, we are here to provide the best Shellac manicure and Shellac pedicure on the Northern Beaches at our Nail Salon in Newport.